It’s now clear that the bane of my next year will be questions about the future of the newspaper industry from journalists. I don’t blame them—newspapers are indeed one of the industries most affected by Free (although that’s just one manifestation of their larger problem: having lost their monopoly on consumer attention). And neither I nor anybody else has any good answers, other than the newspaper business is probably going to shrink but not go away, and that the business model will have to change. But since journalist Malcolm Gladwell has somewhat parochially decided to make the Future of Paid Journalism the focus of his review of Free (which is, ironically, free on the New Yorker’s website; perhaps this is something Gladwell should take up with David Remnick? ), I’ll try to respond in a bit more detail. Well, I wouldn’t propose this as the future of all newspapers, but my model comes from personal experience. About three years ago, I started a parenting blog called GeekDad, and invited a few friends to join in. We soon attracted a large enough audience that it became apparent that we couldn’t post enough to satisfy the demand, so I put out an open call for contributors. Out of the scores who replied, I picked a dozen and one of them was Ken Denmead (at right, with Penn of Penn & Teller). Ken is, by day, a civil engineer working on the BART extension in the SF Bay Area. But by night he is an amazing community manager. His leadership skills impressed me so much that I turned GeekDad over to him entirely about a year ago. Since then he’s recruited a team of volunteers who have grown the traffic ten-fold, to a million page views a month. The other contributors largely write for free, although if one of their posts becomes insanely popular they’ll get a few bucks. None of them are doing it for the money, but instead for the fun, audience and satisfaction of writing about something they love and getting read by a lot of people. So that’s the difference between “paying people to write” and “paying people to get other people to write”. Somewhere down the chain, the incentives go from monetary to nonmonetary (attention, reputation, expression, etc). It works great for all involved. Is it the model for the newspaper industry? Maybe not all of it, but it is the only way I can think of to scale the economics of media down to the hyperlocal level. And I can imagine far more subjects that are better handled by well-coordinated amateurs than those that can support professional journalists. My business card says “Editor in Chief”, but if one of my children follows in my footsteps, I suspect their business card will say “Community Manager.” Both can be good careers. Malcolm, does this answer your question? As some of you may have seen, VQR rightly spotted that I failed to cite Wikipedia in some passages in Free. This is entirely my own screwup, and will be corrected in the ebook and digital forms before publication (and in the notes, which will be posted online at the same time the hardcover is released), but I did want to explain a bit more how it happened and what we’re doing about it. First, as readers of my writings know, I’m a supporter of using Wikipedia as a source (not the only one, of course, and checking the original source material whenever possible). I disagree with those who say it should never be used. But the question is how to use it. In my drafts, I had intended to blockquote Wikipedia passages, footnoting their URL. But my publisher, like many others, was uncomfortable with the changing nature of Wikipedia, and wanted me to timestamp each URL (something like this: http://en.wikipedia.org/wiki/Chris_Anderson page viewed on July 8th, 2008), which struck me as clumsy and archaic. So at the 11th hour we decided to kill the notes and footnotes entirely and I integrated the attributions into the copy. Also note the VQR is not saying that all the highlighted text is plagiarism; much of is actually properly cited and quoted excerpts of old NY Times articles and other historical sources. And as you’ll see, in most cases I did do a writethrough of the non-quoted Wikipedia text, although clearly I didn’t go nearly far enough and too much of the original Wikipedia authors’ language remained (in a few cases I missed it entirely, such as that short Catholic church usury example, which was a total oversight). This was sloppy and inexcusable, but the part I feel worst about is that in our failure to find a good way to cite Wikipedia as the source we ended up not crediting it at all. That is, among other things, an injustice to the authors of the Wikipedia entry who had done such fine research in the first place, and I’d like to extend a special apology to them. So now we’ve fixed the digital editions before publication, and we’ll publish those notes after all, online as they should have been to begin with. [UPDATE: A draft version is here. The final version will live in the right column of this blog permanently] That way the links are live and we don’t have to wrestle with how to freeze them in time, which is what threw me in the first place. “In 1969, the Neiman Marcus catalog offered the first home PC, a stylish stand-up model called the Honeywell Kitchen Computer, priced at $10,600. 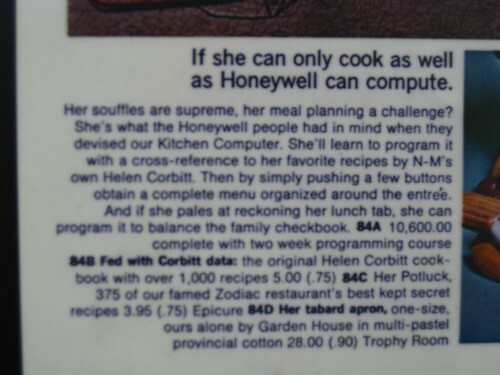 The picture shows an aproned housewife caressing the machine, with this tag line: "If she can only cook as well as Honeywell can compute." That image should be on every cubicle in Silicon Valley; it's a testament both to what technologists get right and what they get badly wrong. To their credit, they understood that Moore's law would bring computing within the reach of regular people. But they had no idea why anyone would want it. Despite countless brainstorming sessions and meetings on the subject, the only application the Honeywell team could think of for a home computer (aside from the perennial checkbook balancing) was recipe card management. So the Kitchen Computer was aimed at housewives and featured integrated counter space. Those housewives would, however, require a programming course (included in the price), since the only way to enter data was with binary toggle switches, and the machine's only display was binary lights. Needless to say, not a single Kitchen Computer is recorded as having sold. Today, of course, we have computers in every home—and in every pocket and car and practically everywhere else. But one of the few things the average person doesn't use them for is managing recipe cards. Don't blame Honeywell—blame the computing world of the 1960s. In those days, computers were expensive mainframes. Because processing power was so scarce and valuable, it was reserved for use by IT professionals, mostly working for big companies and the government. Engineers both built the computers and decided how to use them—no wonder they couldn't think of nonengineering applications. But as the Kitchen Computer hinted, computers would soon get smaller and cheaper. This would take them out of the glass boxes of the mainframe world—and away from the IT establishment—and put them in the hands of consumers. And the real transformation would come when those regular folks found new ways to use computers, revealing their true potential. All this was possible because Alan Kay, an engineer at Xerox's Palo Alto Research Center in the 1970s, understood what Moore's law was doing to the cost of computing. He decided to do what writer George Gilder calls "wasting transistors." Rather than reserve computing power for core information processing, Kay used outrageous amounts of it for frivolous stuff like drawing cartoons on the screen. Those cartoons—icons, windows, pointers, and animations—became the graphical user interface and eventually the Mac. By 1970s IT standards, Kay had "wasted" computing power. But in doing so he made computers simple enough for all of us to use. And then we changed the world by finding applications for them that the technologists had never dreamed of. FREE publication is a month away! 150 books to give away now. The hardcovers of FREE: The Future of a Radical Price just came in and they look great. Pub date is July 7th in the US and July 2nd in the UK. We’ll be announcing the many ways in which you can get bits versions of the book (audio, ebook, web) for free around pub date, but in the meantime, it’s time to start giving away some good old atoms! With The Long Tail, we gave away 200 books to the first bloggers who asked for them and promised to review them (the “long tail of book reviewers”). That worked great, but times have changed. So this time, we’re going to go all full-spectrum on the giveaway. We want to give books to people who will spread the word--as with free digital forms, we think that free is the best form of marketing. Convince us that you’ve got a megaphone, microphone or at least know people who know people and we’ll send you a signed book, weeks ahead of publication. Do have friends in high places? Or low, but very cool, places? Maybe kinda inbetween places but big in Japan? Just know awesome people? I’m _____ and I actually know __[impressive person 1]__, __[less impressive person 2]___ and __[impressive to me even if you’ve never heard of them person 3]___. In fact, I know them so well that I know where they live! (Or at least I can ask them for their mailing address). Send me four signed books, and I’ll keep one and send the other three along with a personal note from me. We’ll enclose three Fedex envelopes paid through our account. All you need to do is fill in the address details and toss them in a local Fedex collection box. We’ll send a book to the first 50 who impress/amuse us. Jon Lund, the head of the Danish Internet Advertising Bureau, and I had dinner in Norway last week and he told me the chilling story of the crazy free newspaper war in Denmark that almost killed everyone involved. I thought it was an important cautionary tale of Free gone wrong, and I encouraged him to write it up on his blog. He did, and it is indeed grim reading. I’ve excerpted (and lightly edited) the basic story below, but it’s worth going straight to the source to get Jon’s analysis, along with a lot of links to other reports on this disaster. Short form: the attempt by a half-dozen newspaper publishers to “out-free” a free Icelandic paper that entered the market (backed by Morten Lund, who made a fortune as an early investor in Skype) ended up costing the collective newspaper industry in Denmark more than $150 million dollars and the bankruptcy of three newspapers. Morten Lund has also been chronicling this disaster, confessional style, on his blog (see here and here). And yes, this all started with the same Icelandic investors who helped take down the world economy. 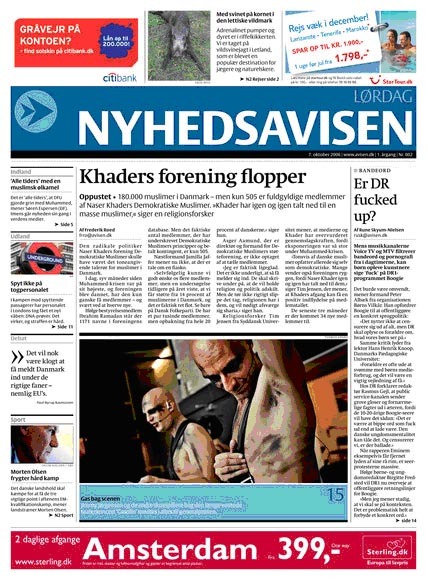 On October 6 2006 “Nyhedsavisen”, a new Danish daily newspaper hit the streets. A quality newspaper staffed with 100 journalists and ambitions of being the largest Danish newspaper with a daily circulation of between 500,000 and 1 million readers (total Danish population equals some 5.5 million). The newspaper would feature an editorial mix prioritizing both prize-winning critical journalism and stories close to the everyday life of ordinary Danes. The pricing of Nyhedsavisen was simple: it was free. And, as something entirely new: it was going to be delivered to the homes of all Danes – at no cost. Not only the newspaper itself was free, delivery was free as well. It was in effect “double-free”. Behind the Nyhedsavisen launch was the Icelandic media group Dagsbrun owned by Icelandic investment company Baugur group. During 2005 Dagsbrun had researched the European market in order to find the most suitable country in which to try to duplicate the success of Icelandic newspaper Frettabladid. And Denmark was chosen. Frettabladid was founded in 2001 and had managed to be the best-read newspaper among the Icelandics (total population: 320,000) battling the only other Icelandic newspaper Morgunbladid by employing for the first time the “double-free” model. Nyhedsavisen aimed at having three different revenue streams, the first one being the traditional newspaper model, where advertisers pay to have ads in the newspaper. If you’re able to get 1 million Danes to read your newspaper, you’re able to sell those eyeballs to advertisers as well. The second revenue stream also aimed at advertisers, but not by offering advertising in the newspaper itself. Instead, Nyhedsavisen would take advantage of the fact is had a direct contact to all Danish households before 7:00 in the morning. Nyhedsavisen would take what would normally have been a cost – the distribution – and turn it into an independent revenue-stream, making money from distribution of printed advertisement catalogues and brochures alongside the distribution of Nyhedsavisen itself. The third revenue streams would stem from the other Danish media. Out of the 100 journalists, 35 were employed at the news network part of Nyhedsavisen, a bureau in the newspaper which should deliver and sell news wire services to other Danish media. Nyhedsavisen thereby aimed to compete with the entire existing Danish newspaper industry, including the three large nationwide dailies Berlingske Tidende, Politiken and Jyllandsposten, the two nationwide tabloid-papers Ekstra Bladet and BT and the existing free daily newspapers delivered through public transportation or handed out on the streets, MetroXpress and (Berlingske owned) Urban. And all of these took the threat seriously, and decided to fight the intruder in an attempt to defend their position on the Danish media market. Right after the initial announcement of the double-free newspaper, Berlingske Tidende (the oldest Danish newspaper, first published 1749) answered back launching their own “double-free” newspaper, “Dato”. This they did on August 16 2006, some two month before Nyhedsavisen would eventually launch. This was Berlingske’s second free newspaper, the first being the “single-free” Urban (which again was launched in 2001 in response to the launch of MetroExpress). The day before, however, the regional daily Nordjyske introduced two free newspapers on top of the paid daily Nordjyske. Centrum Miórgen was single-free, distributed in the morning traffic, whereas Centrum Aften was freely delivered in the afternoon in northern part of Jutland. The day after (August 17) the publisher behind Politiken, Jyllandsposten and EkstraBladet, JP/Politikens hus launched their double-free daily “24 timer”. And on August 21 MetroXpress launched an afternoon-edition in supplement to the usual MetroXpress morning edition. When Nyhedsavisen finally arrived, Denmark was flooded with newspapers. On top of my paid subscriptions I’d now find both Nyhedsavisen, 24timer and Dato in my mailbox, and on my way to work I’d be able to read both Urban and MetroXpress in the metro. On my way home, I’d be able to read the afternoon-edition of MetroXpress. The immediate effect of all this was twofold: the average Dane was getting weary of all the papers he suddenly was forced to have inside his home – and the price of print advertising went down in response the massive growth in supply. This free newspaper war went on for over two years and caused the entire industry to bleed. On top generally declining circulation for all (paid) printed newspapers the cost of producing and distribution additional free newspapers added significant losses to the financial results. Berlingske which was bought by British Mecom in early 2006 was barely profitable then decided in 2007 to back out of the war, closing down their double-free Dato, realizing a loss of $35 million. (Though Berlingske maintained their single-free Urban, continuing in the attempt to offer yet another free alternative to Nyhedsavisen). MetroXpress shot down their afternoon edition after only three months, with losses of some $1 million. After one year Nordjyske eventually also gave up on their Centrum Aften double-free, and merged Centrum Morgen with 24timer. (The Nordjyske engagement in the war however tried out a completely new initiative, editorially combining several print- and webtitles in a very interesting combination - for more see this post). This left 24timer and Nyhedsavisen alone on the scene, trying to wear each other down. Nyhedsavisen were backed by the Icelandic investors, claiming they had “enough” money to carry on to the bitter end. In 2006, 2007 and 2008 the revenues of JP/Politikens Hus totaled a little more than $600 million, with losses of respectively $20 million, $25 million and $30 million each year, taking a quarter of the company’s market cap with it by 2008. The costs of producing and distributing the double-free newspaper was - at least during 2007 - around $200,000 a day for each of the papers. The free delivery was one of the main obstacles. It simply turned out for all of them to be extremely difficult to manage delivering the newspaper at peoples’ home before 7 in the morning. As a consequence JP/Politikens Hus gradually shifted the distribution of 24timer to the single-free handing out in the morning traffic. In March 2008 this shift was total. This partial surrender from 24timer came after Dagsbrun/Baugur group in January found themselves forced to back out of the Danish market. Instead of abandoning Nyhedsavisen altogether, however, a new majority-investor, Morten Lund, entered the scene. Apparently 24timer didn’t find it necessary to keep up the pressure, reasoning a traffic-only existence would do enough harm eventually to kill Nyhedsavisen off. In may 2008 24timer merged with MetroXpress. At that time Nyhedsavisen actually had managed to bring down the cost of delivery to some 20 cents per issue, only 25 percent more than the corresponding cost of distributing the newspapers in the traffic. But little it helped: on September 1, 2008 Nyhedsavisen was no longer able to pay its bills, and was declared bankrupt. Could the “double-free” model have worked? Despite the fruitless attempt to prove the double-free business model during the two years of free newspaper war, the conclusion is not entirely clear. Surely it didn’t work. But it might have functioned under other, less hostile, circumstances. Particularly: the revenue streams from the traditional newspaper-advertising model dried up for Nyhedsavisen due to the fierce competition on the media market in which the excess of supply ensured radically low prices. Also the markets suspicion that Nyhedsavisen might not be able to make it also discouraged media agencies from engaging in longer-term Nyhedsavisen-campaigns. Also, the distribution services never got to work: At first Nyhedsavisen was planned to be distributed in a joint venture with Post Denmark, the official Danish Post, who – on top of their knowledge and professionalism in distribution – had access to an essential asset: keys to all doors of the houses in the large cities. The use of these keys, however, was deemed illegal by the Danish Competition Authorities (after JP/Politiken and Berlingske had filed their complains – while these two ironically entered into their own agreement on swapping keys with one another). Also the massive demand for paperboys to actually deliver all the free newspapers around Denmark caused severe problems for the distribution (all the players were forced to import immigrant-labour from primarily Poland, who then worked their way around Denmark by night, trying to make sense of the signs in the streets in order to figure out their routes in order to deliver the free newspaper in their trolleys correctly). Taking into account that the third revenue stream – the news network delivering and selling news wire services to other Danish media – for various other reasons didn’t turn out a cash-cow either, Nyhedsavisen was in effect left with no revenues at all. From Box UK, a survey of business models used by the top Web apps, most of them variations of ad-supported Free and Freemium. In the chart below, the largest segment (ITA) is ad-supported, the second largest (ISV) is Freemium. After that is referral (ITR) and then the sale of virtual goods (IPV), such as the gifts in Facebook. “We spent a few hours going through the Webware 100 Top Web Apps for 2008, analysing the business model(s) used by each. The chart below shows the results of this survey: 34% use Advertising, 12% a Variable Subscription model, and 8% each for Virtual Products (typically digital downloads), Related Products (typically a large software company offering a free product to attract you to their platform) and Pay-Per-Use. I.P.U Pay-per-use Micropayments: the end-user is charged a fee to use an online service (one-off, or for a limited time). This includes the 'brokerage' model, where user(s) are charged a fixed-price or percentage per transaction (e.g. ebay). This also includes the purchase of ‘credits’ e.g. 10 uses of the service for a fixed cost. Discounts can be offered for bulk purchases. As a former Economist technology writer, I understand the attractions of “simplify, then exaggerate”. But in the case of your article on freeconomics (“The end of free lunch—again”, March 19th), you have done a bit too much of both. Second, there is more to free business models online than advertising. The big shift since the crisis has been the rise of “freemium” (free+premium) models, where products and services are offered in free basic and paid premium versions. Think Flickr and Flicker Pro (more storage), virtually all online games and even your own site (some free and some paid content). Finally, your scorn blinds you to the fact that this crazy idea of giving away content for free and supporting it by advertising is nearly a hundred years old. It is the basis of the standard radio and television broadcast model (“free to air” content) and countless other companies, from the free daily and weekly newspapers to the vast majority of media websites, including all of our own at Conde Nast. It works great—The Economist should try it! Analysts estimate there are as many as 1.2 million Web sites that support themselves by selling advertising, through their own sales forces or ad networks. Most of them constitute the vaunted "long tail" -- small sites serving the refined interests of niche audiences, whose existence is premised on the Internet's near-barrierless opportunity to create and distribute content. But the term "long tail," based as it is on such abstruse mathematical concepts as Pareto's law, can seem bloodless. It hardly does justice to the countless lives made better because of the ad-supported Internet. That's where IAB came in. We made a seven-minute movie to put a human face on the long tail. We call it I Am the Long Tail. Actually, I lied. The IAB didn't make this documentary about the long tail. The long tail made the movie about itself. We reached out to sites we'd come across, and to online networks, for help in showcasing the almost limitless diversity of the ad-supported Internet. Our purposes were varied. As I noted in the YouTube video I made (I even downloaded the software that turned my Macbook into a Teleprompter) seeking contributions to our documentary, "The IAB wants advertisers to understand that small publishers are a foundation of their businesses -- that you're a vital channel to reach the American consumer. We also want policymakers and regulators in Washington and our state capitals to recognize that small digital publishers are critical to American economic growth, nationally, and in every Congressional district. This is really cool, and one of the things I like best about it is that they didn’t feel the need to link to me, mention the book or even link to the Wikipedia entry. The Long Tail is now just part of the parlance—no more needing a credit than an invocation of the Tipping Point requires a link to Malcolm Gladwell. Which is as it should be. One of the paradoxes of early 20th Century management was the observation that companies are best run as dictatorships, while countries are best run as democracies. Why was this? Management theorist Charles Barnard, in his theory of the firm, proposed that it was because organizations existed for a common “shared purpose”. Countries, on the other hand, existed only to serve their people. Shared purpose required singular vision, leadership and top-down control. Serving the people, on the other hand, benefits from bottoms-up recognition of needs and collective decision-making (voting). Many people mistakenly think that open source projects are emergent, self-organized and democratic. The truth is just the opposite: most are run by a benevolent dictator or two. What makes successful open source projects is leadership, plain and simple. One or two people articulate a vision, start building towards it and bring others on board with specific tasks and permissions. The best projects are the ones with the best leaders. Social media, on the other hands, doesn’t exist for a shared purpose. It exists to serve the individual. We don’t tweet to built Twitter, we tweet to suit ourselves. We blog because we can, not because we have signed on to a blogging project. Seen this way, open source projects are like companies. Social media is like a country. Benevolent dictatorships rule the first; democracy the second. The point: the nature of participation is very different between open source and social media, even though people tend to lump them together into "peer production". Open source is hierarchical by design, while social media structure is simply ruled by popularity.